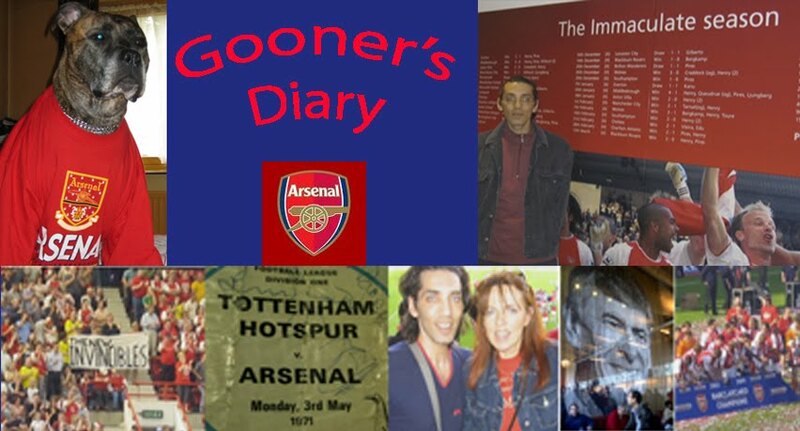 Gooner's Diary: Champions League? You’re Havin’ A Larf! It was vital that we beat Spurs on Saturday, to ensure that we re-established the natural North London order of things. It’s been so long since Spurs presented any sort of real threat, that Saturday’s triumph inspired the sort of quasi-religious fervour on the terraces, of the sort that’s only previously surfaced at our new stadium during those riotous few minutes, before a ball had been kicked in last season’s fateful Champions League semi. With Premiership football being such a global attraction, that’s so far removed from the parochial contest of yesteryear, there are many Gooners nowadays who struggle to fully appreciate the intensity of the local rivalry. Unless you’re old enough to recall an era when Arsenal and Spurs jockeyed for supremacy amongst the First Division’s “big six”, or you happen to be confronted by the enemy in your midst on a daily basis, amongst friends and family who kick with the wrong foot, you’re bound to be more bothered about getting one over on your Man U, Chelsea, Liverpool supporting pals, than the prospect of swatting the irritating Lilywhite fly a couple of times a season. Thus the appearance of Harry Redknapp’s team on the competitive radar has undoubtedly added some spice to the current campaign. If only due to the delicious prospect of savouring the Schadenfreude, knowing their lofty aspirations will inevitably end up shot down in flames, sooner or later. I know of one particular Gooner who refuses to go to the Spurs game and who won’t even watch live on the box because he gets so stressed out. After stealing occasional glances at the scoreline, I wonder if he felt safe enough to tune in at 2-0 up on Saturday? But as I dashed around to the game, late as ever, passing the hordes of old bill gathering on Blackstock Road, accompanied by an intimidating soundtrack of barking Alsatians and buzzing helicopters, I understood why someone might choose to stop at home. Cynic that I am, I’ve always wondered if the powers that be are intent on provoking the sort of trouble that will justify their presence and the substantial cost of all that overtime. Since to my mind this sort of high-profile police presence actually creates an antagonistic atmosphere and often acts as an open invitation to the mindless larrikins who might want to challenge authority. There are plenty of undesirables on either side of the North London divide and perhaps I’m bound to be biased, but the atmosphere rarely feels anywhere near as menacing at our place, as it invariably is at White Hart Lane. Perhaps Spurs fans have grown accustomed to needing an alternative source of entertainment, or an outlet for their frustrations. But for genuine fans of the beautiful game, as opposed to anyone looking for a barney, this over-bearing police presence means that the derby is less of a game and more of a mission. ; where the objective is to get in, get a result, get out and home safe! After so many years of eating our dust, Tottenham will have turned up on Saturday, hoping that Harry Redknapp had at long last afforded them an opportunity to shrug off their innate sense of inferiority. 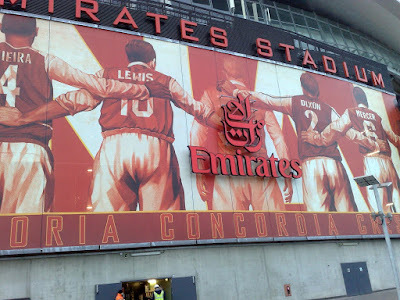 However if they needed any reminder of their down-trodden status during the Wenger dynasty, they arrived at our gaff to be greeted by images of Vieira, Lewis, Dixon and Mercer on the 4th enormous mural adorning the outside of the stadium, above the away fans entrance, with these 4 former heroes linking arms with the 12 Arsenal legends on the three other existing murals. While we debate the 16 players who’ll feature on the 4 remaining murals, which will soon result in a ring of 32 Gunner greats circling the entire ground, it’s wonderful to turn up to each game to experience this transformation in progress. I’m no psychologist but I sense this “Arsenalisation” process is having the desired effect, ramping up the feeling of pride for the fans (and who knows, perhaps for the players alike), as each successive home game reveals new reminders of our illustrious past. Perhaps it’s wishful thinking, but should this effort contribute to a building momentum on the pitch, which eventually results in a concerted title challenge, it’ll be an impossible act to follow next season! I was actually a little disappointed on Saturday, as last Wednesday’s programme referred to “the Spirit of Highbury” installation, which is an elongated team photo type image, including every player & manger who ever appeared at the old ground. With a six-page poster of this image in the centrefold of Saturday’s programme, we wandered around outside, after the game, searching in vain for the original. Having showed the poster to a steward, who was even more bemused than me, he instead invited us back into the ground to view the two new displays portraying our European conquests and managerial records, on the concourse walls inside. All we could find outside was some scaffolding, where I assume we can look forward to seeing this impressive photographic installation, mounted at a home game in the near future - although you can be certain I won’t be able to resist taking regular detours on my way home, in the hope of seeing it sooner. The board’s efforts to create more of a fortress Arsenal feel to the new place certainly seemed to bear fruit at the weekend. Although, sitting in their comfy, cushioned seats, there’s an inevitable inertia amongst the Arsenal’s nouveau fans. Instead of waiting for events on the park to inspire a white-hot cauldron like atmosphere, I only wish they’d realise how advantageous it can be the other way around, when the atmosphere can be the catalyst for the performance. We seemed second best all over the park up until then, as if the flat-footed players in red & white were the only ones present who didn’t fully appreciate the significance of this encounter. One could question whether there was an element of arrogance in the way we appeared to be waiting for our guests to give us our ball back, perhaps counting on them to eventually begin to flag. I was far from alone in my frustration, screaming myself hoarse with my unrequited pleas to “put them under”. Sadly, others were far less encouraging. Abou Diaby’s inept first-half display was in danger of developing into a repeat of the shameful Eboué episode, as the crowd’s counter-productive ire only made Diaby an increasingly nervous liability, perhaps lingering in the centre of the pitch, to remain out of earshot of the venomous diatribe. Mercifully our fickle fans instantly forgave and forgot, as the building tension resulted in the entire stadium going bonkers when Van Persie found the back of the net. I was still celebrating, giving the Spurs fans beside us the finger and only just turned in time to see Cesc’s knife through butter build up to his scinitillating second. I felt some sympathy for my Spurs mates, as instead of going into the break feeling quite pleased with their performance, it was game over! And as if to add insult to their injury, they discovered they’d drawn Man Utd away in the Carling Cup quarterfinal. After the last couple of games, there was no counting chickens at the break. Surely we’d learned enough not to throw away a third successive win? But in truth, with their one-dimensional attack, a Spurs comeback was never on the cards. Moreover, the best atmosphere in the stadium to date, offered an amazingly reassuring sense of our 12th man’s capacity to deny Spurs the slightest encouragement. The Scousers demise is a blessing in disguise because it offers the chasing pack someone else to shoot at, other than us. Psychologically, it makes a massive difference for the Arsenal to be mentioned in the same breath as Chelsea and Man Utd and considering how we were being written off before the season started, I’ll be perfectly content if we can remain the outsider, coming up on the rails. Arsène might be obliged to talk up a title challenge, but I need not tempt fate. Ask me again after Xmas! Spot on, Bernard. Spare a thought for poor David 'Big Time Charlie' Bentley though. Excellent Post. Very well written. Are you a daily or weekly blog. I have not come across your blog before. Keep up the good work. It's always extremely gratifying when my humble efforts are appreciated. I always post once a week (Sun/Mon), as this is often the unedited version of the column which appears in Weds edition of the Irish Examiner. Occasionally, I'll post other pieces, if I can find the time.